Common milkweed blossoms attract many insects, including this bee and many different butterflies. Common milkweed is in bloom in Westborough's meadows, fields, and roadsides, ushering in the height of butterfly season, which is typically the first two weeks of July. Kids—and former kids—usually know common milkweed (Asclepias syriaca) by its dry pods and the fluff that floats on fall breezes, bearing seeds to new places. But milkweed is also a premier butterfly plant, producing abundant nectar that feeds many kinds of butterflies in the early summer. 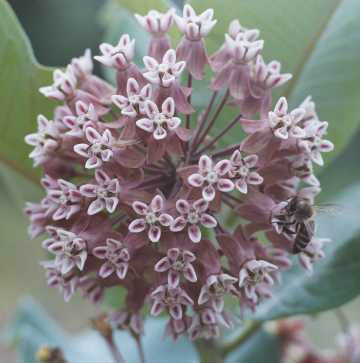 Common milkweed's drooping clusters of dull pink flowers release a heavy, sweet scent that attracts many different butterflies and all sorts of other insects. At night, the aroma draws moths to the flowers. This scent once made milkweed a favorite for a vases in Victorian homes. Most people enjoy butterflies, although many of us aren't crazy about caterpillars. But butterflies (and moths) come from caterpillars. Metamorphosis transforms a well-fed caterpillar's body into a butterfly's or a moth's body in the safety of a chrysalis or cocoon. So if we want butterflies, we need to think kindly of caterpillars. Common milkweed helps to bring us beautiful monarch butterflies (Danaus plexippus), which are considered "milkweed butterflies." The leaves feed the monarch caterpillars, which can be recognized by their black, white, and yellow stripes. The adult butterflies search out milkweed and lay their eggs on it. When the eggs hatch, the caterpillars begin to munch and grow. Eventually a caterpillar forms around itself a green chrysalis, which hangs under a milkweed leaf and protects the caterpillar while it develops into a monarch butterfly. 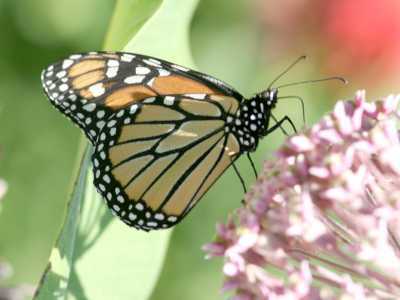 The monarch butterfly is a "milkweed butterfly" because its caterpillars feed exclusively on milkweed leaves. To find common milkweed and to watch butterflies, head for meadows or fields. Look for milkweed among the tall grasses along the mowed paths through the fields at the Westboro Wildlife Management Area operated by Massachusetts Fish and Wildlife off Milk Street (Rte. 135 on the way to Northborough). Search for milkweed at the Bowman Conservation Area in the unmowed edges of the field next to the picnic pavilion. Or follow the trail across the road from the Bowman Conservation Area parking lot and visit the small 3-acre meadow that WCLT's "Make a Meadow" project is restoring. There's a bit of milkweed right in the middle of it. Check out WCLT's butterfly garden at the Andrews Street entrance to the Headwaters Conservation Area. Not only are you likely to see butterflies in the garden, but you'll find common milkweed in the dry field behind the butterfly garden, about halfway down the hill toward Mill Pond. You can even see milkweed along the weedy edge of the Andrews Street parking area. As a "weed," common milkweed is not hard to find in other sunny, open places. For example, you'll see it in bloom on both sides of Arch Street right next to the railroad bridge. This native plant is stout and often 3 to 5 feel tall. It has large oval leaves, which are easiest to spot when they turn yellow in the fall. Milkweed is named for its thick white sap. When you find a milkweed plant, break a leaf or stem and wait for the milky white juice to ooze out. In folk medicine of the past, this milky sap was sometimes used as a kind of bandage. People spread it on their skin in a thin film over wounds or ulcers, protecting them during healing. Native Americans used it to treat warts and ringworm. This "milk" or "latex" helps the milkweed plant defend itself against insects. It's sticky enough to gum up the mouths of many small insects that start to nibble the plant. This goo can also trap ants and other crawling insects that poke small holes in the plant with their feet as they climb up toward the blossoms. There they would help themselves to nectar without pollinating the plant, as larger bees, wasps, butterflies, moths, and hummingbirds do when they push into the flowers. Some insects manage to get around milkweed's defenses. The caterpillars of the monarch butterfly, as well as the bright red milkweed beetle (Tetraopes tetraophthalmus), have the habit of cutting a major vein in a milkweed leaf and letting the milky goo run out. Then they start eating further down on the leaf, where very little milky juice is left. If you notice a partly eaten milkweed leaf, you'll probably see that the chewed part is near the leaf's tip. Milkweed has other chemical defenses as well. It contains chemicals known as cardiac glycosides, which make it acrid and bad-tasting. The cardiac glycosides are potentially toxic because they can affect an animal's heart muscle. Their effects discourage grazing animals. Certain insects actually put milkweed's defenses to work for themselves. The monarch caterpillars, the milkweed beetle, and yet another insect called the milkweed bug (Lygaeus kalmii) all feed exclusively on milkweed and get special protection from doing so. These insects have evolved a tolerance for milkweed's toxic cardiac glycosides. These chemicals do not harm these insects. Instead, the chemicals remain in the insects' bodies and make them distasteful or poisonous to predators, who quickly learn to avoid them. Even adult monarch butterflies are protected by the chemicals they consumed as caterpillars. Birds have actually been photographed as they vomit after eating a monarch butterfly. And the protection extends even further. Birds and other predators learn to avoid eating monarchs, so similar-looking butterflies such as the viceroy (Basilarchia archippus) get some protection, too. Milkweed plants spread slowly in an area by underground runners, forming clumps of plants that are genetically identical "clones". Butterflies and bumblebees, which fly considerable distances, pollinate plants in one area with pollen from plants in other areas. This cross-pollination promotes the genetic mixing that can be helpful for the survival of a new generation of plants when wind-borne seeds land in a new area. Early European settlers collected the fluff from milkweed pods to use in pillows and mattresses. They also sometimes mixed the hairs of the fluff with wool or flax in making thread for sewing. Native Americans used the milky juice in making dyes. People have found ways of eating common milkweed in spite of its bitterness and potential toxicity. Some earlier residents of New England ate the young shoots like asparagus. Some Native Americans stewed the blossoms and then ate them like jam. The key to getting rid of milkweed's bitterness and toxicity involved cooking the plant in boiling water, rather than in cold water that's then brought to a boil, and changing the water several times. Milkweed has also had medicinal uses. Native Americans used a root tea as a laxative and as a diuretic for kidney stones. Physicians of the past used it to treat asthma and rheumatism.